Home→Upcoming Books→Hear the Buzz about SONGS OF MY SELFIE! 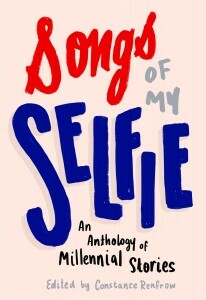 Songs of My Selfie: An Anthology of Millennial Stories (April 2016; 978-1941110409) has received some INCREDIBLE blurbs, with more rolling in every day. We’re positively thrilled to share them with you! Amidst potato guns, abortions, and multiple references to popcorn-buttered lip-licking, Songs of My Selfie alternates between snapshots of self-doubt, self-discovery, and self-determination. It’s sweet and confident and deft and challenging. You can chew on it, and there’s just enough killing and dying to remind us of our own mortality. That, after all, is what a quarter-life crisis is all about: a fear that the balloon of our selfhood will pop before it gets the chance to float away. Some of us have been there, some of us are there, but all of us can enjoy a mirror into the moments when we most loudly become ourselves. I recommend this book wholeheartedly. —Ron Dakron, author, Hello Devilfish! Have you read an advanced copy of Songs of My Selfie? If so, leave us a review on our Goodreads page! Haven’t read it yet? Preorder your copy on Amazon today and help support new writers! And follow us on Twitter @SongsOfMySelfie or on our Facebook page for updates about the book, new promotions, giveaways, and more!